Xylophone provides reports with a complex structure in forms of spreadsheets (XLS or XLSX format), PDF files or direct output for printing based on the XML input data. It can be used as command line tool and as a Java library. The system has two separate XML parsing modes: DOM and SAX. The DOM mode allows for greater flexibility in defining the structure of the input data and the XML data reading with greater memory and computational resource requirements as a cost. The SAX mode introduces a few insignificant limitations on the XML file structure and on the reports descriptor, though it outperforms XML mode both memory consumption and performance wise and therefore is suitable for generating huge reports. Apache POI — used in parsing and creation of Excel-compatible data. Apache FOP — used in PDF creation and printing output. XML file with the source data. .XLS or .XSLX template which defines the layout and format of the output document. XML descriptor designating the input data traversal. The output of the system is a file featuring the file extension and format corresponding to the input template (.XLS in case the template was .XLS or .XSLX otherwise). Further, the output XLS may be forwarded to the next stage and converted into a PDF file or sent directly for printing. usage as a command-line tool. Usage as a Java library. To use as a command line tool, unzip the “xylophone-VERSION-bin.zip”. This archive contains folders named “lib” and “bin”. The “bin” folder contains shell scripts for launching in Windows and Linux environment. copytemplate — presence of this parameter defines if the template will be copied entirely to result with all of the contents present before the process. To use Xylophone as the library you need to import ru.curs.xylophone.XML2Spreadsheet class and call its static method called process: XML2Spredsheet.process(…​). There are several overloaded versions of this method with the following parameters. File/InputStream xmlData — source data. File/InputStream xmlDescriptor — descriptor data, describing the order of data iteration. File/InputStream template — the report template. ru.curs.flute.xml2spreadsheet.OutputType outputType — report template type (OpenOffice, XLS, XLSX). This argument is omitted if the arguments xmlData, xmlDescriptor, template are of type File. In such case, the value of the argument is deduced by the template’s file extension. boolean useSAX — parsing mode, DOM if false, SAX if true, the differences are listed below. boolean copyTemplate — should the template be copied prior to data emission. Optional argument, false by default. The option is used if the existing contents of the templates need to be transferred to the output. For instance, existing diagrams, graphics, and other things. OutputStream output — the output stream which the system’s output will be written into. Additionally there is the XML2Spreadsheet.toPOIWorkbook(xmlData, xmlDescriptor, template, useSAX, copyTemplate) method, which returns an instance of org.apache.poi.ss.usermodel.Workbook, serving an object-based report representation. This method will be useful in cases where a report is to go through additional post-processing step prior to serialization. at the specified moments the template fragments are copied to the resulting document; the template data fields are filled with information in the context of the current element in the XML data file. The description of the XML data file traversal via the description of three possible modes is below. All the other <element> tags must also have the name attribute. In element reading mode, the system reads the child tags of the <element> tag from the descriptor file. They can belong to one of the following types: <output> and <iteration> The system switches to output mode or iteration mode respectively. There can be any number of <output> and <iteration> child tags in the <element> tag, and they can go in any order, since the system processes them in sequence, one after another. Direct specification of the tag name. In this case, the interpreter starts to process <element> only if the tag name in the scanned data file matches the one specified in the attribute. * value (asterisk). In this case, any tag in the data file is suitable for processing. A simple XQuery expression of type tagname[@attribute='value']. Processing occurs only when the tag name matches the tag name value, and the attribute value equals value. NOTE: we only support expressions of this type, with a single attribute and the "= " sign. The <, > characters, and Boolean expressions with multiple conditions WILL NOT work. Only a tagName[@attribute='value'] expression will work (quotes can be single or double, depending on the circumstances, using " is also allowed). (before) and (after) values. They are used to output a "prologue" and "epilogue" of a sequence of elements. The context value of the current data item is remembered in order to restore it after the iteration is completed. If the <iteration> tag does not have an index attribute, all subelements of the current element of data document are read, and each of them is set as the current one successively. If the <iteration> tag has an index attribute, it is read, and set as the current specific subelement of the current element. The value of the index attribute can be an integer starting from zero. After the next current element is read and set, the system sequentially reads all subelements of the <iteration> tag, which can only be of the <element> type. If the <element> tag with the name=”(before)" attribute is encountered, then the parent data element is processed first, making it possible to output the “header” of the elements sequence. If the value of the name attribute of the <element> tag matches with the name of the current element (or the name attribute is set to '*'), the system switches to the element reading mode described above. If the <element> tag with the name=”(after)" attribute is encountered, the parent data element is processed last, making it possible to output the “footer” of the elements sequence. 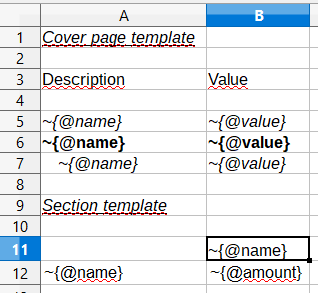 no value – the template fragments that are presented in output mode are arranged from top to bottom in the resulting document. horizontal – template fragments are arranged from left to right in the resulting document. The <iteration> tag can have a merge attribute. 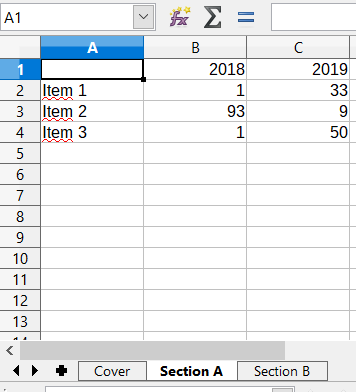 If the integer value of this attribute is greater than zero and equals N, then the N first columns (or N first rows, depending on the vertical or horizontal mode) of the iteration-formed block will be merged into one cell. It is useful for building reports in which the merged cell must cover an alternating number of rows or columns. The <iteration> tag can have the regionName attribute. If this attribute is set, then the iteration-formed block at the end of the iteration will be converted to a named range with the specified name. After the iteration is completed, the system restores the context value of the current element for subelements that started the iteration. sourcesheet — an optional attribute that points to the template workbook sheet from which the output range is taken. If not specified, the current (last used) sheet is used. range – an optional attribute, template range, that is copied to the resulting document, for example “A1:M10”, or “5:6”, or “C:C”. Usage of ranges of rows like “5:6” in left-to-right output mode or of column ranges like “C:C” in top-to-bottom output mode will cause an error. worksheet – an optional attribute. 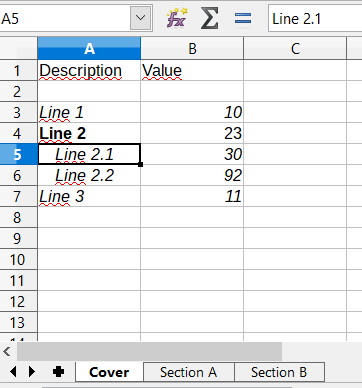 If it is defined, a new sheet is created in the output file, and the output position is moved to the A1 cell of that sheet. If you define a value for this attribute that is equal to a constant or XPath expression, the sheet name is substituted from that constant or the result of the expression. pagebreak — if this attribute is present as pagebreak="true", the output of the next section of the report will start with a new page. In this case, if the current output mode is from top to bottom, then a horizontal page break is formed, and if it is from left to right, then a vertical page break is created. Sometimes “widow” and “orphan” lines in the report are unacceptable (this often relates to the footer elements with the results and signatures). If the Xylophone report is created for instant printing (without manual adjustment), the pagination should be performed correctly at once. Let’s say we need a report consisting of a title sheet and several section sheets (names of those are defined by input data). Suppose the title sheet has a hierarchical list of elements that belong to different levels and require different render. The key to creating reports via Xylophone successfully is writing correct Xpath expressions. Those expressions are extracting data from current XML file’s context; if you’re not familiar with Xpath you can learn more about it here . current() — will be replaced with a full XPath expression to the current node during extraction. It is a full analogue of the XSLT’s current() function, essential for complex XPath expressions. The presence of this function is justified for the same reasons as in XSLT’s current() (please refer to XSLT’s documentation on current() and its distinction from . (dot)). position() — an iteration number. Will be replaced with the number of a current iteration during extraction. Helps with simple sequential numeration of steps in the report (you can use it instead of placing numeration to file’s tags). Please note that the template may contain some illustrative information that won’t end up in the resulting document. It’s a good practice to provide some explaining information in your template, making further improvements easier. Just one <iteration> tag inside every <element> tag. XPath links can point only to the current element’s attributes; position() function is supported. If you restructure your XML data file this way, you can have point 1 and 2 executed for a wide range of tasks — for example, you can easily restructure XML for the “representative example”. Using the Excel2Print module you can converse the resulting Excel report into a PDF file or send it for printing right away. Please note that you can process only XLS files this way, the system does not support XLSX-to-PDF processing yet. The system is not capable of outputting to PDF/printer any picture, shapes and charts, and in the nearest time that won’t be an option. During the first launch the system caches fonts’ metrics, so it could take a while. command sends PDF file to a printer and also has several additional parameters.